When considering fitness equipment for the home, people look for quality and convenience. The ﻿﻿LifeSpan TR 1200i Folding Treadmill﻿﻿ features both in its updated fitness features and quick storage capability. Increased interest in health, fitness, and daily exercise goals has caused an explosion in exercise product options for consumers. Most of the ﻿best treadmills﻿ now include new technology that records fitness goals, such as daily step tracking, as part of their updated features. With all the choices out there, it’s important to know what to look for. How much space do you have to house a treadmill? Will you be running, walking, or a combination of both? What information do you want the machine to give you? What type of deck surface is right for you? Space: Even if you have your own home gym, a folding treadmill is useful to make room for other activities that require extra floor space, such as martial arts training, dance workouts, or group yoga. When ﻿choosing a ﻿﻿﻿﻿foldable treadmill﻿﻿﻿﻿﻿, look for one that is easy on your back and not cumbersome to relocate. Activity: ﻿Interval training﻿ is the number one workout runners perform on the treadmill, so if this is your purpose, make sure your treadmill provides the pace adjustment you need. Look for ease in toggling through full mile pace increments rather than partials such as tenths and halves. Information: Good treadmills offer information on time, ﻿calorie burn﻿, distance, and speed. Great treadmills report on ﻿heart rate﻿, step count, and allow you to track your exercise data. Flexibility: Shock absorption is essential for ankles, knees, and back. Look for a treadmill that offers compression shock absorption. Goals: Are you looking for weight loss, cardio fitness, or performance improvement? Choose a treadmill that provides the means for you to progress through your goals in a variety of fitness programs. 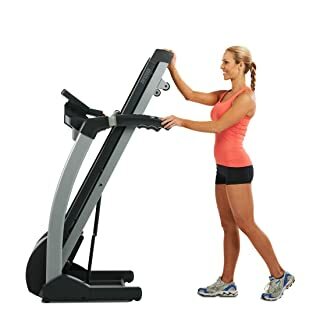 The Lifespan TR1200i Folding Treadmill features EZ Fold technology that utilizes hydraulic shock, which aids in both lifting and lowering the deck. I find this feature to be extremely beneficial because nothing is worse than getting into an exercise routine, and then having to quit because you’ve hurt yourself. For further injury protection, I like that the deck includes six compression shock absorbers. This provides flexibility and protection for joints and the lower back. And safety is further enhanced with the side rails and automatic shut down when the track is dormant for 20 seconds. This gives me a piece of mind when my mother or child are using the machine. The continuous duty 2.5 horsepower motor is noted for being quiet, which is great because my music does not compete with the sound of the machine. The multi-colored LCD display includes information on time, calorie expenditure, distance, and speed as well as program options for weight loss, sports training, and heart rate, so this machine does it all. The QuickSet™ options for speed allows for one-mile increment changes up to 6 mph, so if you need to jump quickly to a higher speed, this feature is lacking. 21 exercise programs are available for targeted fitness goals such as cardiovascular training and weight loss, and step count technology is supported by Intelli-Step. Through USB (sold separately) you can capture workout data for transfer to your personal computer. This feature is great because I can see my progress, even when I feel like I’ve hit a plateau. Flexibility: This treadmill is great for both walking and running. Quiet Motor: Your TV or music will not compete with this treadmill for your attention. Versatility: 21 exercise programs allow for variety in your cardio and fat-burning workouts. Ease of storage: The hydraulic system makes folding and unfolding easy on your back, and the wheels allow for easy relocation. Step count: This technology is up to date with the current step counting feature. Customer service: Online, over the phone, and personal service is available depending on your needs. Data: Keep track of your goals and fitness level via the data collection feature. Unsupported data feature: USB not included for data collection. Manual: The accompanied guide provides few explanations of the varied functions and features. Inadequate for interval training: The 20 seconds to cutoff feature is not conducive to HIIT training. Low speed values for QuickSet Feature: Speed increases for full mile increments are programmed up to 6 mph. Past this, the only option is 20 second intervals. On-Off switch: Inconveniently located at floor level. Poor placement of reading rack: Display is unreadable when magazine or tablet are used. In summary, this Lifespan TR 1200i review asserts this machine is useful for anyone looking for a ﻿quiet machine﻿ that can handle consistent motion rather than interval training. The data features allow you to track your progress towards your fitness goals but be sure to order the USB hardware if this data collection option is important to you. The ability to fold and store the treadmill makes it attractive to consumers with space concerns. Furthermore, I love the fact that I can pretty much do any kind of workout I want to. For me, boredom will keep me from exercising, and this machine provides plenty of options, so I don’t run into that problem. Plus, for a family, it’s nice to have one machine that can meet the needs of each person. All in all, this is a useful product for customers who want the flexibility and convenience of ﻿hom﻿e wor﻿kouts﻿. Assembly is pretty straight forward and it takes about 30-40 minutes to assemble the treadmill, as main pieces came already assembled. The treadmill comes with all required tools. it should be lubricated every 3 months or 50 hours of use. Even if treadmill wasn't used the running belt must be lubricated as it dries out with time. There is an indicator icon on the computer display that illuminates after 100 hours of treadmill use signaling that the belt lubrication must be performed.